MEMPHIS, Tenn. (AP) The Denver Nuggets did something no NBA team has done in almost seven weeks – lost to the Memphis Grizzlies. 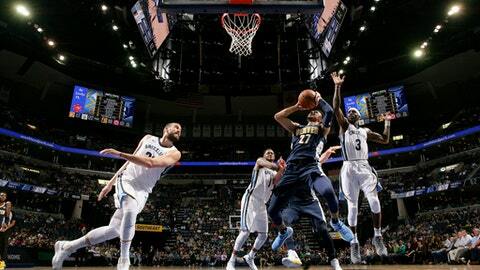 Dillon Brooks scored 24 points, Tyreke Evans added 20 and the Grizzlies snapped a 19-game losing streak with a 101-94 victory over the Nuggets on Saturday night. The Nuggets, who entered the night in ninth place in the Western Conference, failed to gain ground on the final playoff spot by losing to the team entering the night with the league’s worst record. The defeat was a lousy first step as the Nuggets embark on a seven-game road trip. They don’t return home until April 1 against the Milwaukee Bucks. The Nuggets, who played without leading scorer Gary Harris due to a right knee sprain suffered Thursday against Detroit, struggled through a miserable first half of shooting, connecting on 22 percent in the first quarter. Memphis stretched its lead to 21 early in the second quarter before Denver cut it to 53-48 at halftime. Malone expressed his disappointment with the starters and their lack of energy. ”Our starting group did an awful job of starting the game with any real sense of urgency, and we built ourselves a 21-point hole on the road,” Malone said. Wayne Selden scored 16 points for Memphis by hitting 6 of 7 shots, including 4 of 5 from outside the arc. Nikola Jokic led the Nuggets with 17 points and 12 rebounds, while Jamal Murray finished with 16 points on 5-of-18 shooting. Denver shot just 37 percent overall and 27 percent from 3-point range. Memphis never trailed, although the Nuggets tied the game twice near the eight-minute mark of the fourth. The Grizzlies scored the game’s final five points to win for the first time since defeating the Phoenix Suns on Jan. 29. Nuggets: The seven-game road trip is Denver’s longest stretch away from home this season. … Started 3 of 19 from the field. .. Are 11-22 on the road this season. … Are the last Western Conference team to lose 20 consecutive games, dropping 23 in a row during 1997-98 campaign. Grizzlies: Held a halftime lead for the first time since the losing streak began. … In the third, made six 3-pointers and only a trio of 2-point baskets. … Avoided losing nine straight at FedEx Forum, which would have been a first. ”If we’re coaching effort at this time of the year, we have a big, big problem,” he said. Gary Harris, who averages 17.7 points a game, injured his right knee when he collided with a basket stanchion against the Pistons. Nuggets: Play the second game of the trip Monday against Miami. Grizzlies: Begin a three-game trip against the Eastern Conference on Monday in Brooklyn.